Well, gentle reader, the answer is, “Yes.” For Isis, our mostly black cat, has not only a game, but an arena in which to play it. When we fold laundry, we dump it onto the bed and set the empty basket on the bench at the end of the bed. And then it’s Game On. She hopes onto the bed when she sees the laundry coming, and then jumps down into the Arena of Isis (which sounds like something the other Isis would have). 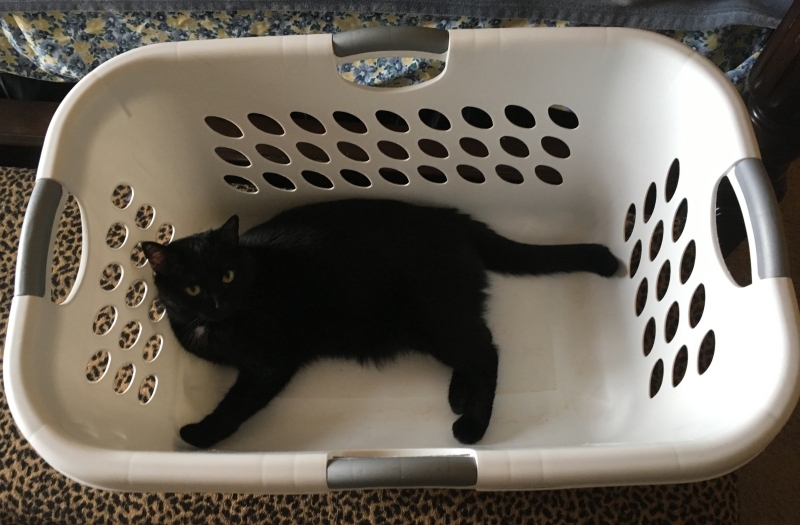 The game is to poke her through the holes in the basket while she tries to paw and bite the poking fingers. Apparently, she loves it, because she keeps coming back for more. Fortunately for her, there’s always more laundry at Nogglestead. Speaking of the Buddhism I’ve been reading, this book is a collection of aphorisms (as the back says) in the Buddhist mindset. Apparently, it’s just one long scroll or collection of musings or verses that the translator has helpfully broken into chapters (Contrary Ways, Watchfulness, The Mind, The Flowers of Life, The Fool, The Wise Man, etc.). You can tell that the author has broken this up because some of the content of the chapters flows away from the ascribed topic/title and then the chapter ends where a new topic begins and can be titled. So in the original, it would have been a single document just flowing. Not that I minded the chapters, though; the aphorism are in numbered verses, so it would have been like a long poem without them, and you probably know by know how I feel about long poems. At any rate, it’s calming and pleasant to read, and the content mirrors the other things in Eastern philosophy I’ve read and is not far off from the Christian Stoicism I’m also currently reading and even the parables of Jesus: Slow down, don’t worry, help others, do good. You know, the practical aspects of many religions–that is, the pragmatic, how to live content, is similar no matter how wildly the ontology or eschatology differs. Which is why I prefer these little guides and comfort reads more than the heavy philosophy or theology most of the time. Worth a read if you’re into this sort of thing. So I ordered an LP off of the Internet. 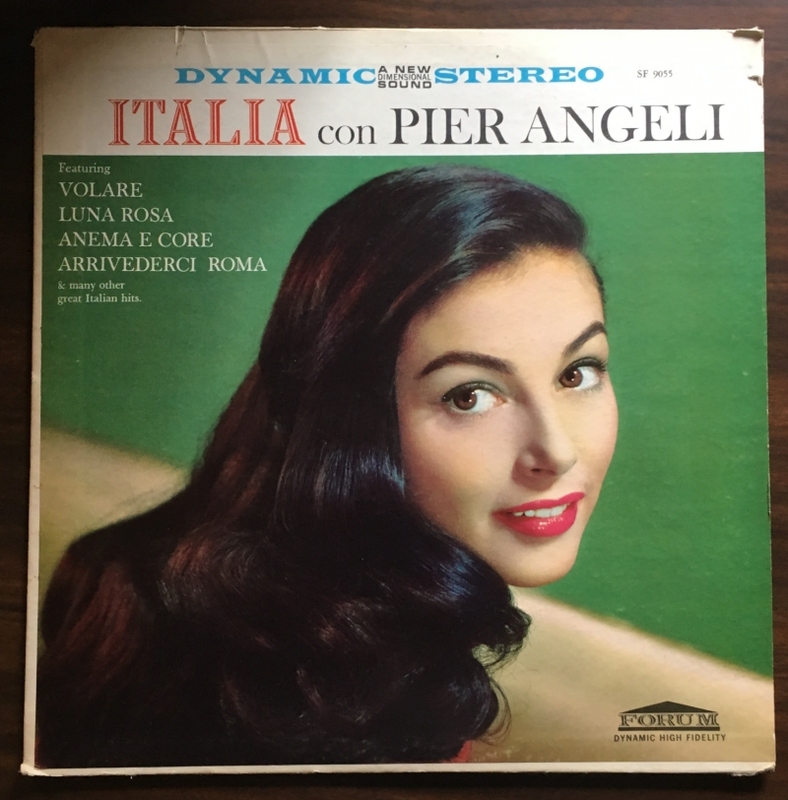 As you might know, a pretty woman singing in a foreign language falls into my songbird wheelhouse. Where did I hear about this LP? If you’re keeping track, Dustbury is responsible for my buying the following artists: Against the Current, Pier Angeli, Rebecca Black. Kelley of Suburban Light, some years after the blog ended: Electric Six. So a couple years ago (five? six? ), my mother-in-law got my children a little indoor basketball hoop for Christmas. It was handmade from wood and had a Mizzou window cling glued to the backboard. She picked it up during her annual Christmas bazaar safari which often yields crafted gifts. It came with a number of soft balls or bean bags, long since gone. But when she gave it to the children, it was with the caveat: The decal was falling off or had fallen off, so Daddy would have to fix it. So it went out into the garage, where simple projects go to die. Or at least languish for a long time. You might think Nightmare Town is New York based on previous evidence, but no. It’s a collection of Dashiell Hammett’s short stories. I would have expected that I read them since I have a couple of different editions of The Thin Man and The Glass Key, including two volume New American Library set, but those must only be the novels. This book collects twenty of Hammett’s pulp stories, so you’ve got detective stuff along with the occasional Western. Several feature the Continental Op, three feature Sam Spade, and the first five chapters of his first stab at The Thin Man conclude the book (a little unsatisfyingly, though, since it does not resolve, and it differs from the published version enough that I wanted to see how this book ended, too). The stories are terse in the pulp style–fancy that!, and they’re pretty good for the most part. Some of the plots a touch convoluted, though, and a couple of the stories turn on gimmicks, both of which are also a hallmark of pulp. 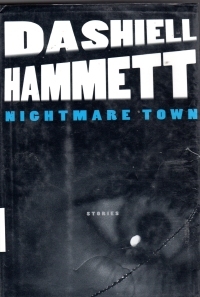 But you know what you’re in for if you’re reading Hammett. I’m pretty slow at reading short stories, though, as I’ve mentioned, since each story requires a little reset time that makes stopping easy at bed time. Still, I’m glad to have read it. The Twee Goals of Brian J. You know, gentle reader, every year I set a couple of goals for myself. Not resolutions, and not a little thing, but not a major thing (conquer the world is a centennial goal, not an annual goal). And sometimes I get a notion into my head that’s like a little goal, and two weeks ago in Michigan, I got an idea in my head kind of reminded me of my goals. So we stayed at a resort that’s a seasonal ski resort (which meant it was very affordable in the summer). Our unit looked out onto the snow tube run, which meant we looked across the end of the run and some of the seasonal equipment, which provided a vista for my reading when I read all those books whose reports you’ve just read (or will read when you scroll down). From the edge of our balcony, though, we could look up Boyne Mountain (something that we can kind of scoff at even here in the lower part of the Ozark Mountains). But the hill behind us and the mountain itself with its ski runs rises something like 450 feet in the course of a football field. And I got it into my head that I wanted to walk up the hill. I mean, I saw a bunch of people out for walks on the pavement, and a couple cutting across the fields to get up to the amenities across the road, but I didn’t see any hikers going up. 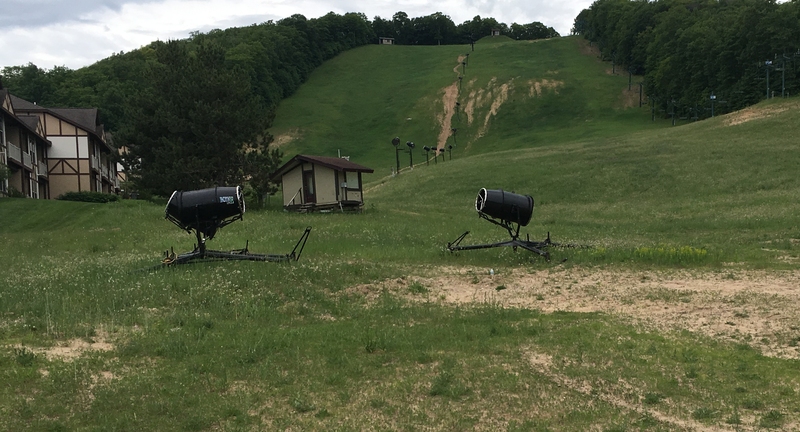 I didn’t see any hiking trails listed in the amenities of the resort, but they did have a ski lift running to take you to the scenic lookout for a small fee. The rest of the family planned a day at the waterpark, which left me free to pursue my stated goal instead of reading for the whole day. Of course, then the self-doubt and worry creeped in. Michigan up there is fairly forested. Might I run into a bear going up the hill? It’s cleared well to either side, but, man, would I feel dumb if I encountered a couple cubs halfway up and had to fight off the mother with a pocket knife. We didn’t cover that in tae kwon do classes, even the weapons classes. Also, I’m not twenty any more. Or thirty. Or, heaven forfend, forty. I’ve walked up some hills in my time, but this was nominally a mountain. At least it was on the brochures. But I mentioned doing it, and as the morning evolved, the rest of the familiy did not dart out to the water park immediately, and when I asked if the boys wanted to accompany me to the top of the hill, the younger of my boys, the one most unflappable and with no sense of self-preservation or danger at all, said he’d go with me. So I was on the Daddy hook. No, he never called me Daddy–he always called me Father when he was young, but now I’m Dad, which is better than Fat. But now I couldn’t back out, even less than when I announced my intention. The slope was, what, 45 degrees? Something like that. I was afraid of slipping and falling. I mean, I haven’t done any hiking for reals, and certainly not in tennis shoes, since I was a kid. But I had my son along, and I had to show no fear of falling. Maybe a little concern about my age and having a heart attack (although a properly falling during a heart attack might have carried me down the hill to help). So I started up, watching my feet all the way up. I resolved not to look down or back as I climbed. Brothers and sisters, I could have saved Eurydice. Well, except for the music part, unless I bored Cereberus to sleep with my guitar practice like I bore my instructors. I was a bit dismayed at my heavy breathing, which I tried to disguise in conversation with my son through clever ventriloquist tricks, but I noticed he was panting, too, and I felt better. And then we were up the hill. The hilltop held a couple of buildings hidden from the lower view, but no real place to sit to share the water I’d brought. Don’t get me wrong–it wasn’t an hour’s hike. It was twenty minutes or so. But more incline than I’m used to in my super sprint triathlons (well, the one). So we shared a bottle of water and took a picture. At the summit, as it were, I didn’t enjoy the view that much or feel a sense of accomplishment, really, because I knew we had to go back down. We climbed up the left side of the above picture, which is more steadily steep with a bit of a valley in the middle (for water run off, perhaps). On the way down, we came on the lit tubing side, which has some level spots. Of course, since I’ve never been snowtubing, I didn’t realize the level spots were ramps for jumps or bounces, and that the level spots were followed by sharper drops for those snowtubing thrills. Still, I did better than Wesley on the way down, still watching my feet. My older son had come out, a dot on the green below us, to take our picture, but he didn’t recognize the two specks as his kin, so I’m afraid there’s no picture from that angle. When we got about half way down the hill, the youngest started to run to his older brother, and he made it alive. But his cautious father continued a plodding pace until I reached terra level. “So what does that have to do with your goals, Brian J.?”, you might ask. Even if you don’t, I’ve given it some thought, and here it is: It illustrates how I relate to my goals and my accomplishments. It seemed daunting at the run up to the doing, and at the outset, but basically I put one foot in front of the other, and I–well, we–climbed the hill. 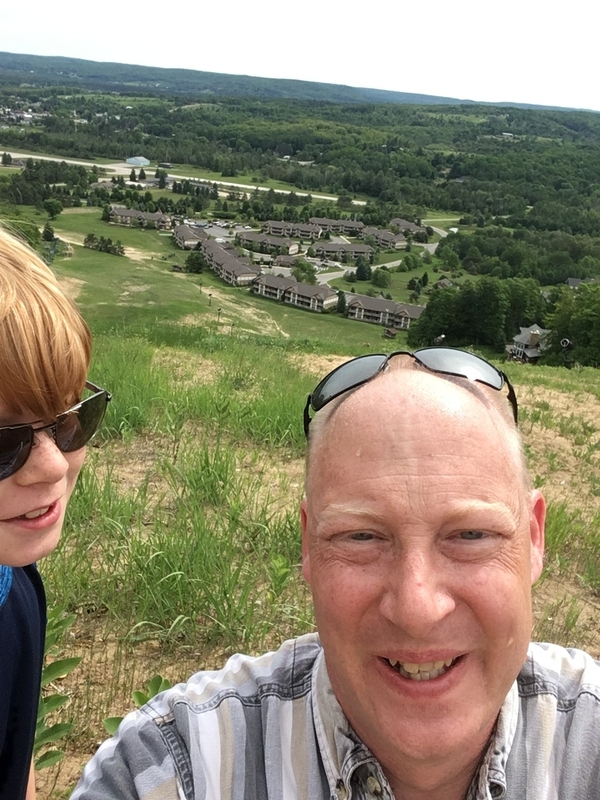 When I was atop the hill, I didn’t really enjoy the view because I was thinking of what was next (in this case, the climb down, which was just as treacherous–which is to say, “Not Very”–as the climb up). And once I’d done it, it was not a big deal, and I’m not really going to bring it up lest I seem boastful. Well, except with you, gentle reader. If you’ve been following along, you know I’ve done some things and met some goals, but having done them, of course I’ve done them. I get them done by carrying on, and I don’t necessarily enjoy the doing on the way to the accomplishment. Then I don’t get much enjoyment out of having done them. What a poor frame of mind. Clearly, I’m more of a Camus Existentialist than a Neitzsche Übermensch. Which is also probably clear by all the Buddhism, Taoism, and Stoicism I read. Much of which I read because I keep trying to change my attitude for the better. Hopefully, I can plod my way to peace of mind eventually. George Skarich of Mid Continent Nail Corp. says President Donald Trump’s tariff on steel imports could put the company out of business. “Cheap nail imports from China and other countries don’t face this tariff and are increasing every day. We need our wire to be excluded from this tariff or we will have to increase the layoffs we’ve already begun,” Skarich says. The Poplar Bluff-based 500-employee operation is said to be one of the last major U.S. nail manufacturers. JSW Steel USA plans to invest $1 billion in facilities in Mingo Junction, Ohio, and Baytown, Texas. “We are going to be hiring over 1,000 people,” JSW President and CEO John Hritz told CNBC. Hritz credited President Donald Trump’s steel tariffs for allowing the company to supply more steel for defense and infrastructure purposes. Now, I’ve not studied Common Core math, but this looks like a net positive for employment numbers. I note, though, that the headlines blame Trump for the job losses but credit the company with job creation. 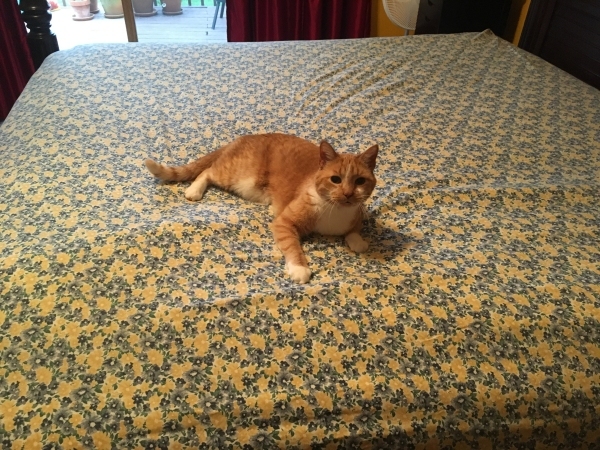 So when we make the change the linens on the beds here at Nogglestead, it’s game on for a couple of our cats. Roark likes to jump on the bed and chase his tail while we settle sheets and blankets on him, after which he will pounce out if we turn the linen so his head is near the end. So today I had the bright idea that I would change both the beds in the master and the guest bedrooms at the same time. That way, when he hopped onto one bed to do his little game, I could go into the other room and put on a linen before he followed me in there. Then, when he hopped up onto the bed, I could go into the other room and put on a linen. It worked, briefly. 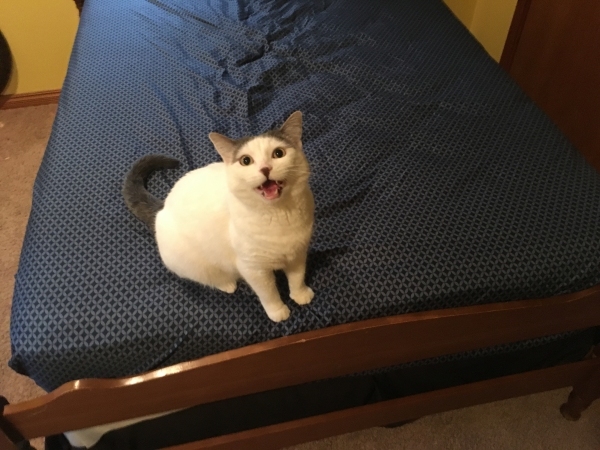 I got fitted sheets on both beds and a flat sheet down in the master bedroom, when an unexpected complication arose. Now, Chimera plays a different game: He will lie without moving on the bed and let you completely make the bed on him. Then he will lie there under the sheets and blankets all day. Which is disconcerting, because I tend to worry that he won’t be able to breathe. But so far, so good, clearly. So all chores were suspended for a bit until the coast cleared, but I did get a little song out of it. Beddest cat in the whole dang house. My beautiful wife claims that the third line is not in rhythm, but I insist because Chimera lacks a hard stop, the Chimera is really sounds like three syllables instead of four. I would claim that I am a poet, but she is, too. And although she has more magazine appearances than I not counting college journals, I have more earnings from poetry so far than she does ($100 for my poem in There Will Be War Volume X puts me ahead of a lot of poets in lifetime earnings) and more full length poetry collections (one) than she does, so I argue from authority. I bought this at the Island Book Store on Mackinac Island when I was up there last week. As you might know, when I travel or where I live, I like to pick up a book on the local history. 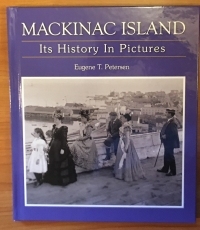 I picked up a couple of books about Mackinac Island, and I started with the picture book because it was easier to browse in the airports and on the planes that brought me back. This volume is the second edition of a couple thousand copies, mostly sold to the tourists like me, I bet. It has a collection of images, which includes photos the middle of the 19th century, but also maps and drawings of the area and principals. Mackinac Island’s history traces back to the fort on the island that has been strategically important since before the Revolutionary War, so there’s a lot of history to represent, but relatively few photos until it becomes a tourist destination around the turn of the 20th century. As such, most of the images are of tourists, hotels, and attractions with a smattering of photos of old buildings from pre-photography days taken in photography days. It’s a quick browse and a bit of an educated, historical piece of memorabilia to remind one of his visit to the island. But for real historical narrative and insight, I expect one will have to delve into the actual textual books one purchased in Michigan. Note: It’s not the height of pretentiousness if the author calls himself “one,” or even “the author,” if the one author does not capitalize. Thank you, that is all. As I mentioned, I recently returned from a trip to Michigan. 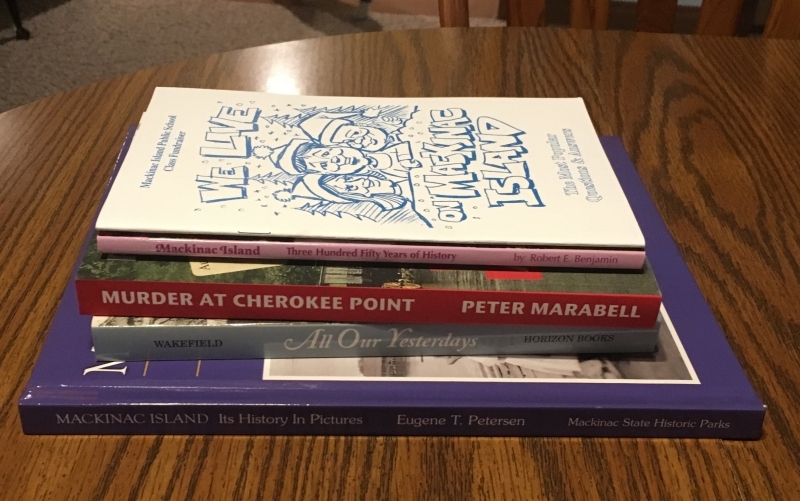 What are you going to read if you’re going to Michigan? A book set in Michigan which is a series of poems/songs about Native Americans. The Song of Hiawatha is a collection of native American folk stories told in verse. Wordsworth based some of the work loosely on the studies of explorer Henry Rowe Schoolcraft, who also visited the Ozarks and has a section of the local highway named for him. Which I mention only because it’s interesting how mobile some people, particularly explorers, were in those old days. The plot, as it were: Hiawatha, a heroic figure if not a demigod, has multiple adventures where he fights fantastic beasts and learns things to share with his tribe. He wins Minnehaha and befriends a couple of fellows. Then the friends and Minnehaha die, and when the white man arrives, Hiawatha leaves his tribe and heads west. 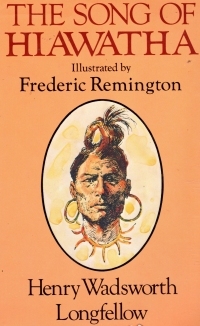 As I mentioned previously, I recently read an excerpt from The Song of Hiawatha in a collection. You know, I’ve been resistent to reading long-form poems, but this book was fairly easy to read. Part of it lies in the poem itself, with its song-like rhythm, its breaks into chapters and even stanzas within the chapters. Part of it lies in the layout of the book, with only 27 lines to a page and lots of white space. When you get a big collection of poems whether by a single author or a collection, you often get lots of lines jammed onto a page in tiny print which makes it harder to read as your eye can skip over lines easier. Or maybe I’m just getting old. But I’d like to point out that my collection of poetry, Coffee House Memories , is pleasingly arrayed in the paperback edition. The Kindle edition, well, you’re reading on an electronic device anyway, you damn kid. Strangely enough, tucked into the book was the Reader’s Digest edition booklet discussing the book. Reader’s Digest released a number of classics in a subscription collection, and with each book, they sent a small pamphlet with information about the book and the author. I think I’m going to start collecting and placing these pamphlets along with the teasers for Classics Club editions in a binder so I can show them to houseguests when it’s time for the houseguests to leave. The Reader’s Digest pamphlets are particularly informative. This book had a forward of its own to give that sort of context. Many times, I don’t read the forwards because they tend to be critical essays best read after you’ve read the book, but this forward was informative and context-building. At any rate, I liked it a bunch, and it’s starting to cement my enjoyment of American poetry, especially that in the vernacular, contrasted with British Romantic poems. See also my book report on Little Orphant Annie and Other Poems by James Whitcomb Riley. Back in December, I was talking to an engineer, and I said that my FitBit was precise, but not necessarily accurate, when it gave me 250 steps’ credit for sitting on a bar stool and speaking expressively. The engineer was impressed that I knew the difference being that I have an English degree and all. So when I saw this book on the sale cart or in the sale room at Hooked on Books in January, I bought it, even though I figured it might be a kid’s book. 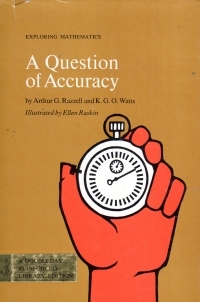 As a matter of fact, it is a kid’s book, but it’s a discussion of the philosophical aspects of accuracy. That is, the book talks about the different aspects of what sorts of measurements are “good enough” for the task at hand and how you can always improve accuracy with better instruments. It also talks a little about the challenges of accurately representing measurements (the problem with maps, for example, which are flat representations of a sphere). And the book also mentioned the Mackinac Bridge, which was fitting since we were vacationing in Michigan at the time and I drove over that very bridge a couple days later. So, yeah, the book reading has been kind of light this year; I’ve been starting a lot of long books and not finishing even the short books I’ve started. I’m not even at forty books and the year is almost half over, but you can see I’m taking drastic steps. Namely, reading a bunch of children’s books (see also Crosshairs) on vacation. It’s just as well that I read a couple short children’s books because the remainder of my vacation was taken up with a fitting title. Full disclosure: when I moved from a nice suburb and good school district to the trailer park in the middle of my seventh grade year, “R.P.” was the kid assigned to be my friend to help me get around North Jefferson Middle School in Murphy, Missouri. He was a smart kid. I was a smart kid. I’d like to think we were numbers 1 and 2 in the smarts for our seventh grade class, but I might be giving myself far too much credit. By the time we finished high school, I certainly dropped a couple points in the rankings because I didn’t put any effort into my schooling, and he did. But I digress. We go way back, and when I saw he had a book, I ordered it. 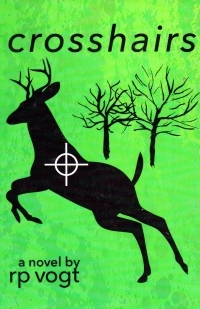 This is a young adult novel about a boy (about my kids’ age) who gets to go hunting with his father, uncles, and cousins for the first time. While he’s there, he finds one of his cousins stealing from other family members, and the book deals with the fallout of that including a run in with a local hood. It’s a short book (120 pages) with none of the cartoons that are rife in the Diary of a Wimpy Kid or “James Patterson”‘s Middle School series. I’m not sure how much the book captures the zeitgeist of contemporary middle schoolers, but my oldest has expressed interest in the book, so I suppose he’ll let me know. The questions the lad has about honoring your word and doing what’s right in spite of your word are real and tangible concerns for a young man, and thematically the book works. So I enjoyed it well enough. But I’m probably giving some weight to being pleased that someone I knew wrote a pretty good book. And, quite likely, has sold more copies of this one book than I’ve sold of all three of my books. Curses, R.P. wins again! I’ve encouraged my beautiful wife to try this method, but to no avail. Of course, our gardens don’t have corn since it’s a little dry for corn around here in the late summer time, and she is probably right to be doubtful about native methods since my attempt to use the “three sisters” method of growing corn, beans, and squash together did nothing but leave us with a harvest of more spaghetti squash than we could eat (which, to be honest, is any). If you only read one Australian spy thriller featuring a Mongolian mad scientist’s plot to take over the world with a metal-melting satellite, this should be it! Of course, I’m not sure where you would be if you wanted to read two such books, as this probably is the only one. But it’s a series book, so you could easily find other things like it to read. Well, I’ve pretty much given it all away here: Mark Hood, an operative for a trans-national spy agency (which operates freely in the Soviet Union as well as the West because all parties agree to give this group, Intertrust, the ability to ferret out nuclear proliferation concerns). In this book, a strange phenomenon–weapon?–destroys a Japanese fishing fleet and damages a U.S. destroyer, drawing the attention of Intertrust and its dashing hero. Additionally, scientists are disappearing–being kidnapped?–, and hero travels to the Soviet Union to protect a similar scientist only to find the scientist has been snatched away just before Hood and his associate arrive. 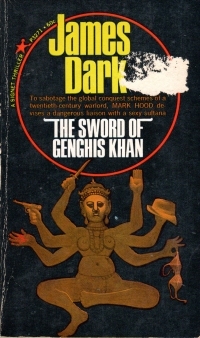 The agency provides them cover to travel to China, and they discover the kidnapped scientist aboard a train with a beautiful young Asian woman who’s delivering the scientist to Mongolia and her father, a distant descendant of Genghis Khan, who has discovered the treasure of Khan and used it to finance a solar-lensing satellite that can target anywhere on the planet with a heat ray. 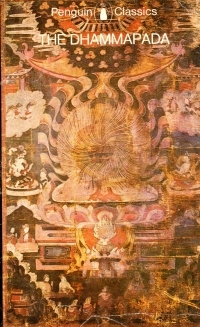 The book is written in a British style. The prose is polished and the story moves along, but it’s a little dry and at a distance. So it’s not that thrilling. The plot, though–outlandish. Somehow the combination of the outlandish plot with the sedate language doesn’t work for me. But it is definitely the best Australian spy thriller I’ll read this year. Whilst in Traverse City, Michigan, my beautiful wife pointed across the street as we where on the way to our car at the parking meter into which we’d dumped all our available change. Traverse City, Michigan, has a hat store. Friends, it’s been six years since I replaced my cover with something I bought off of the Internet because most of America lacks a hat store. So although I was quite concerned about the parking meter situation, I agreed to go in to look for something to replace my hat with. It’s starting to pill in spots, especially on the top of the crown. My hats tend to wear out there, where I grab them and where they get set upside down to hold sunglasses or whatnot. At any rate, although I tend to buy pants from the top of the stack at Walmart and don’t even try things on at the department store, I tend to be fussy in choosing a hat. I have to try on candidates multiple times and look at myself in the mirror with them from various angles. I mean, I know what I want: Fedora, crushable/packable, C-crown, classic brim (not the little contemporary brim), a thin hat band. This time, I was hoping for a lined hat because I was feeling luxe. Which took us from the hats on hangers to the behind-the-counter selection. I tried on some of the nice hats, but so many of them were made from some very thin felt. Eventually, though, I didn’t find something that suited me quite right, and the concern over the parking meter situation won out, so I left without buying anything even though I was in a hat store, dude. 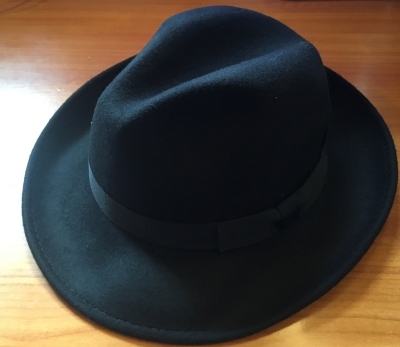 Still, when I held my current hat against other black fedoras, I learned exactly how much it had faded in near-daily wear for six years. So I immediately ordered the same hat I did previously on the Internet. 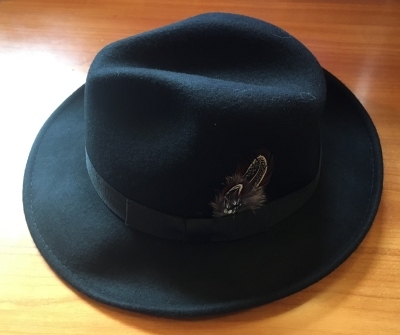 Every new fedora comes with a feather in it. Friends, I might like a liner in my hat, but I’m not so swank as to want a feather in it. So I’m inventing reasons to leave the house so I can wear my new hat. Not that anyone would notice because it’s the same as my old hat, but darker and a bit stiffer. But I know. Also, I don’t want to leave you in suspense with a cliffhanger: We got a ticket, but overstaying your meter in Traverse City is apparently only five dollars, which is not bad considering a city parking lot or garage runs more than that in a bigger city. But I could have tried on even more hats and wasted more of the saleswoman’s time. Well, as you might know, gentle reader, when we go on vacation, we tend to find used bookstores in the area to browse. Unfortunately, on our trip last week to Michigan, we found the book stores are few and far between in that corner of the state. We only hit a couple of these: Horizon Books in Traverse City and Island Bookstore on Mackinac Island. We tried to hit the local place in Boyne City, but it was closed every time we drove by. Murder at Cherokee Point, a locally set mystery novel, and part of a series. Mackinac Island, if you go buy the number of murder mystery series set there is a very violent place. In addition to this author’s three books, I also saw cozies spun off of bicycling and fudge. Five books. And one Ideals magazine. You know what weighed a bunch? Complete sets of clothing I had to buy because United Airlines “Bulk Out”ed my baggage because it stuffed too many people on my flight, which is why I’ll avoid United Airlines in the future. You know what I like? Driving vacations. To places where there are many used bookstores that are not an hour away. Well, it sure was quiet around here last week. That’s because unlike some people, I don’t have a variety of smart people to step up and keep you occupied while I’m on vacation. As it happens, my family and I travelled to the upper part of the lower penninsula of Michigan. Did you know, gentle reader, that United Airlines has a little trick it calls “Bulk Out”? Neither did I until last Sunday. Storms in Chicago led to delays across the board. Our flight to Chicago was a couple hours late, and then our flight from Chicago to Traverse City itself was a couple hours late. So United cancelled the next flight to Traverse City and split the people between our (late) flight and the next. Then, after we were all boarded, the cabin attendant said the plane was overweight and could not take off, so they were looking for a couple volunteers to take a later flight, but she offered no incentive. Then here supervisor stormed aboard, already angry with the passengers since no one volunteered, and threatened to just pull some random bags from the hold to lower the plane’s weight if no one volunteered. But she offered no incentives, and no one volunteered, so United Airlines removed checked baggage–which comes with an extra fee, remember–until the plane was light enough to dance lightly upon the sensitive runways at Traverse City’s airport. It turns out, my bag was one of the chosen few. And by “few,” I mean “Most of the checked bags were taken off.” I had to file a claim at the counter in Traverse City and wait for them to (maybe) deliver my bag to my resort an hour and a half away. So we went to Walmart to buy me a complete set of clothing and the toiletries I’d need for the coming days. 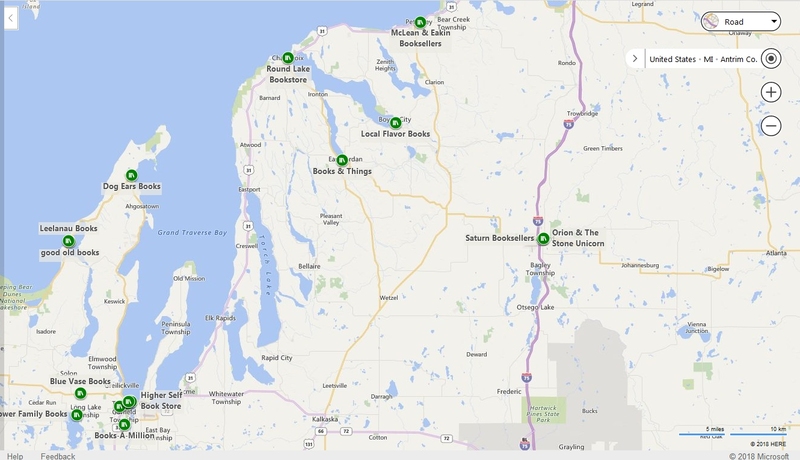 The closest one to our resort in Boyne Falls was in Petoskey, 20 miles away. So we went late on a Sunday evening and pushed a laden cart through the only (Express) checkout open at that time. The “Bulk Out” isn’t the only reason we hit a Walmart–as we often stay about a week in a well-appointed room, we also like to stock up on basic groceries and whatnot. So wherever we go, we end up at a Walmart or a Publix or something. But it did give me an opportunity to remind you that, to United Airlines, you’re just cargo, and they’ve got fine print and procedures for ensuring you know it. ☑ Try to convince the locals to call it the UCLP. St. Louis residents often refer to the hinterlands as UCLA–the Upper Corner of Lower Arnold (Arnold being a small municipality in the extreme reaches of St. Louis County). I tried without success to introduce Upper Corner of the Lower Penninsula into the local idiom. ☑ Wear Packers apparel in enemy territory. Apparently, the lower penninsula is full of Lions fans who suffer from some false optimism this year, as in many years. Of course, I did not wear my Packers shirts outside of the resort. Not because I was afraid, mind you. I just tend to wear collared shirts and khakis along with my signature black fedora out. ☑ Buy the latest copy of Ideals. The book store in Traverse City had the latest issue of Ideals so I bought one. As you know, I associate the magazine of popular poetry with my youth, but it’s still a going concern. 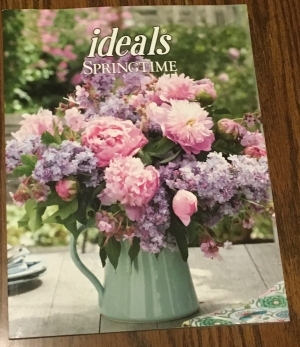 It’s a different publisher in Tennessee, but apparently the target market is still upper Midwest old ladies and middle-aged men trying to recapture something they didn’t actually capture in their youth. I’ve mentioned before how much I lilacs, and how I’ve tried to grow them wherever I go. Well, spoiler alert to that post from 2012: The lilacs don’t grow so well in southwest Missouri. Or when I try to grow them in southwest Missouri. But when we got to the resort, it was the height of lilac season, and as a matter of fact was during the local lilac festival. So I got a snootful of lilac on the balcony while reading or on the pool deck while reading or in just random places while perambulating. It was very nice. It was a five day trip if you lop off the travel days. A couple quick one hour flights, and I was back up north where people talk right (although on the east side of Lake Michigan, people don’t talk all the way right like they do in Wisconsin and Minnesota). We visited Mackinac Island, which means I’ve now been on two of the five Great Lakes. We drove down to one of my beautiful wife’s home towns in Michigan (she has many). And we hit the fashionable Front Street in Traverse City. A pleasant trip, and I got some reading done as you’ll see in the coming days. I just ordered the first season of Magnum, p.i. from Amazon on these little silver discs to watch with my children between James Bond films. I saw someone post on Facebook that there’s a reboot in the works or on television. Hey, it worked for Hawaii Five-O. The person on Facebook was less sanguine about this particular reboot, though. On Sunday mornings, one of the local radio stations plays a repackaged version of the “American Top 40” radio programs from the 1980s with Casey Kasem. One recent Sunday, they played Mike Post’s theme song for this program, which charted in 1982. I was in my children’s room collecting laundry, and on the wall I espied some framed tiger photos, one of which came from my Aunt Dale, who collected tiger pictures and items. She was fond of the mustachioed PIs of eighties television, including Tom Selleck as Magnum and Lee Horsley as Matt Houston, both of whom she would say curled her toes. Clearly, the universe compelled me to get this show and watch it. But I’m not sure I’m going to expose my children to the last season. 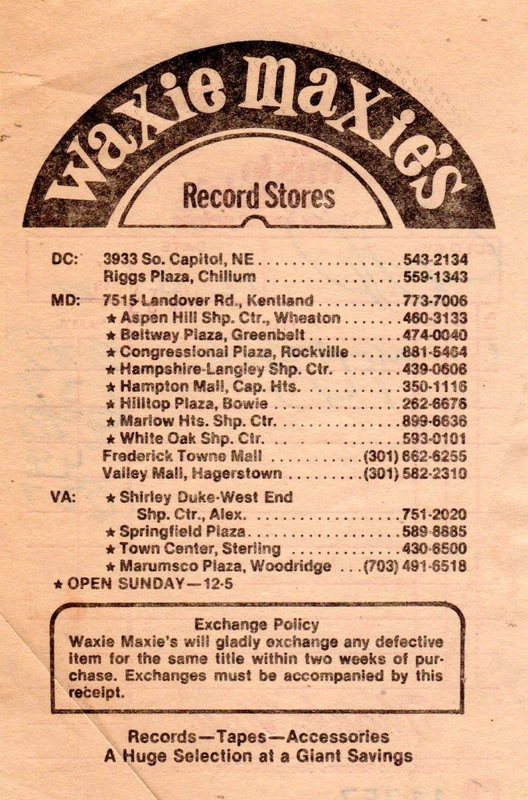 Tucked into a paper LP sleeve, I found a receipt from Waxie Maxie’s, which was apparently a record store chain on the east coast. Before Christmas in 1981. Perhaps it was a Christmas gift. In my life, it was the first Christmas without my father in the house. I couldn’t tell you what I got–I know one year I expected an Atari because my mother hid one of the neighbor’s gifts in our basement so her son wouldn’t find it, and we found it, but we got Donkey Kong and Frogger tabletop electronic games instead, but that might have been 1982. At any rate, this little sales slip has traveled quite a ways, as I bought the LP in which I found it in southwest Missouri. Also, the LP purchased that day was apparently Conway Twitty’s Heart and Soul, and I found it in Stargard’s self-titled debut album. Well, the Internet is the place for floatsam like this, so here you go. 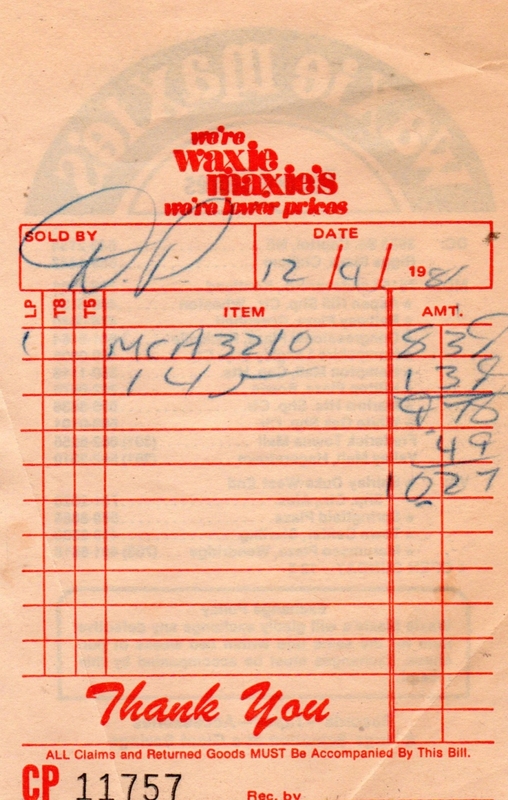 When I complain about the cost of a $15 CD, remind me again of how much this LP would have cost in today’s dollars.